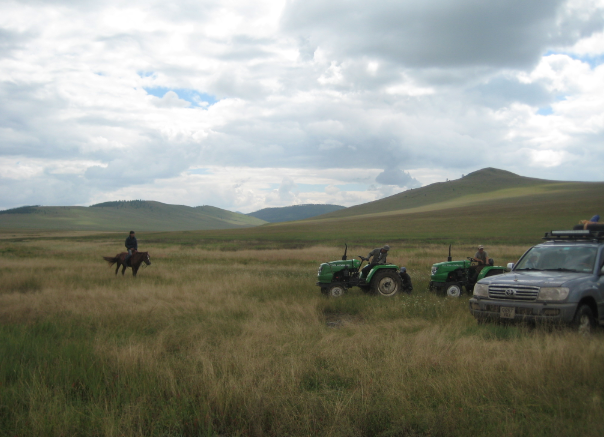 One of the best benefits of my trip to Mongolia was reading three books about the country and the 13th Century expansion of the Mongol Empire. 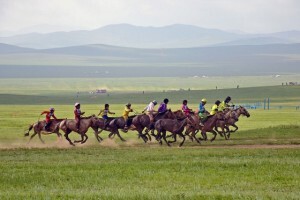 I had only known about how barbaric the Mongol hordes were. In fact they supposedly killed 40 million people during their conquests. Their empire ended up encompassing five times the area of the Roman Empire and just slightly less than the British Empire, which was the largest of all the world’s empires. 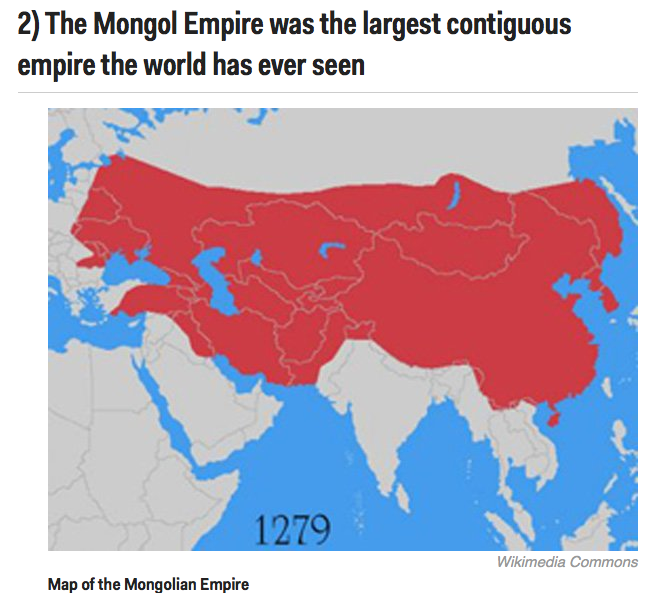 The Mongols ruled one-fourth of the the world’s population at that time, from the Pacific Ocean to the Mediterranean Sea. This is larger than North America, including the United States, Mexico, Canada, Central America and the islands of the Caribbean…about the size of the African continent! Not bad for an illiterate outcast who was left to die on the steppes. But Genghis, his sons and especially grandson Kublai Khan created an amazing civilization in the 13th Century with numerous positive achievements: expanded trade (which aristocrats in other cultures thought historically was undignified, immoral and beneath them), cross fertilized Europe, Middle East, India and China with new ideas (helped lead to the Renaissance), technologies, the first international postal system (pony express), best of medicines and healing from all cultures, paper money, one new calendar (each culture formerly had its own), abolished torture and accepted religious freedom (Mongols were shamanists), when Europe was increasing torture and killing the non-believing heretics during the Inquisitions. Genghis also established laws that EVERYONE (including leaders and nobles) had to obey, created a meritocracy, so that any peasant with talent could rise to be a general or top administrator (not the case in other civilizations), pushed printing and paper over scribes and vellum, not imposing their language, religion or culture on the conquered, etc, etc. Who’d of thought it! Fabulous military strategists though they were, they made no technological breakthroughs, wrote few books, gave the world no new crops or methods of agriculture. Their own craftsmen could not weave cloth, cast metal, make pottery or even bake bread. They manufactured neither porcelain nor pottery, painted no pictures, and built no buildings—they did build bridges for their army. And they collected and passed on all the skills from one civilization they conquered to the next. 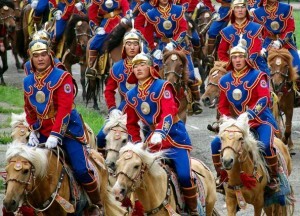 They had two secret “weapons.” They practically lived on their horses…each warrior had 3-5 each. This meant they did not need long supply lines and also could move faster than their opponents who relied mostly on plodding infantry or larger, elegant but much slower armored horses with knights in heavy armor. Inside his mushroom-shaped, one-room house with no privacy, called a ger, this little boy posed for a photo. His brothers had been outside beating long lengths of hide cut into narrow strips against a rock to soften them up for use as leather ropes. 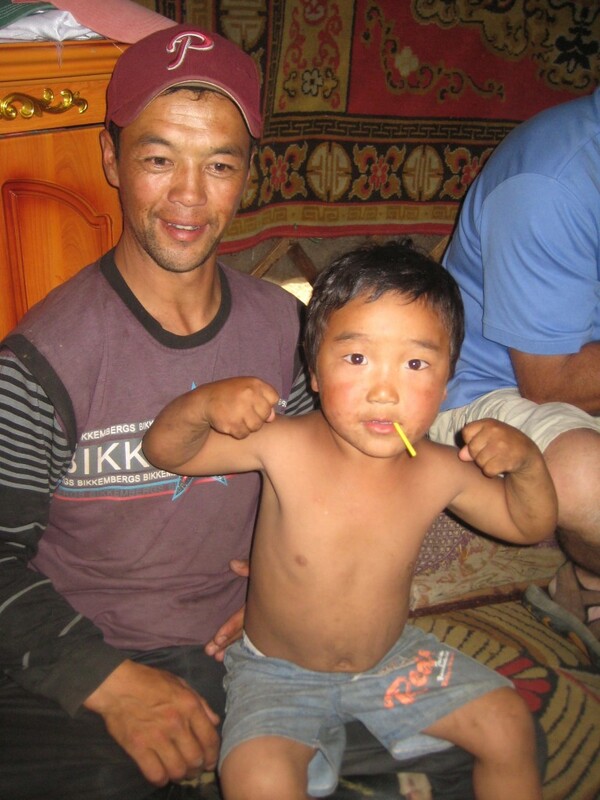 I saw their dad the night before on his motorcycle rounding up his herd of horses and flocks of sheep and goats. 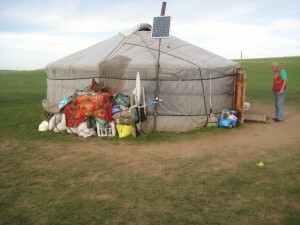 Their nomadic life on the grassland steppes is hundreds, maybe thousands, of years old. And their love of some sports is the subject of another post. 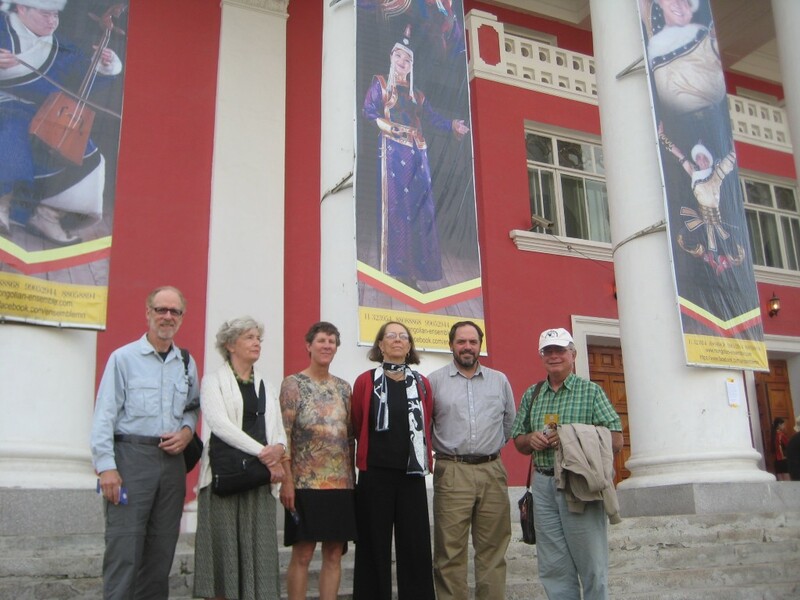 After returning to Mongolia’s capital from a week of camping, we had only an hour to clean up and change quickly in the hotel, so we could attend a dance performance at the State Opera House. I stripped right away to shower, but only then discovered there were no towels in the room. Bummer. Hard to order towels, when the staff doesn’t speak English. I had to dress and go downstairs, and then took my shower anyway…though I was the last of our group in the lobby, we made it to the performance on time. Many years ago I went to Brazil to study capoeira, the very deadly martial art that the slaves there disguised as a dance with musical instruments and songs to fool their 18-19th Century masters. The subtle moves in grimy, sweaty practice halls were nothing like the colorfully costumed, public renditions seen by uninformed tourists in nightclubs. But who knew. 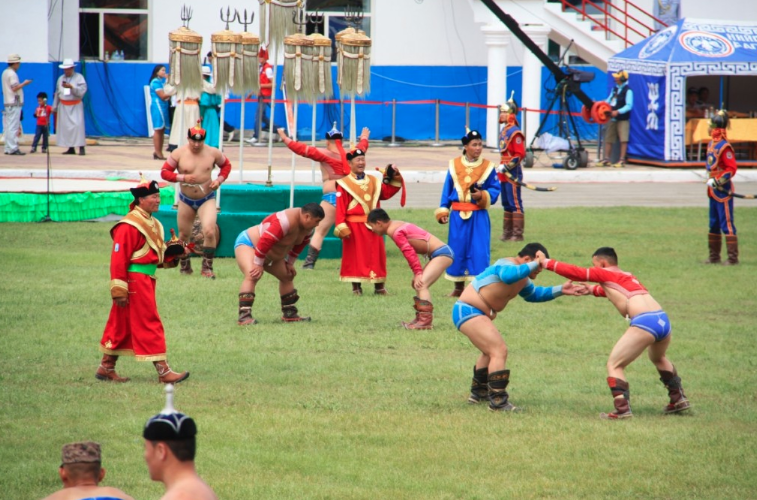 I enjoyed many of the choreographed dances I saw in Ulaan Baatar that night, and have looked at over 100 videos on youtube to select some for you. But I have the impression now that what I saw in Mongolia was a commercial production for tourists, just as the capoeira presentations for night club acts in Brazil was not so authentic. 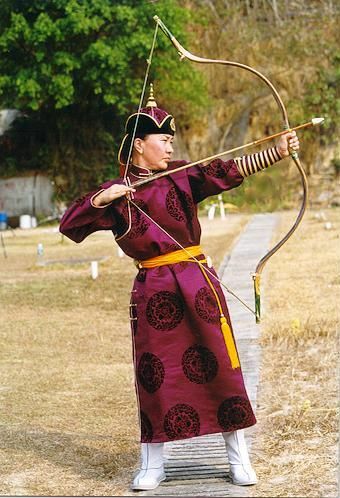 One of the scientists on our trip told me the costumes are not traditional, and I gather now that many of the original dances were done inside gers, so there is almost no space to prance around. Nevertheless. Here are some peppier selections I like with comments underneath. Start at 1:20. This was one of my favorites actually performed by this same group. The announcer at the concert said the cups on their heads were supposed to be filled to the brim with mare’s milk and not one drop is allowed to be spilled. this clip above shows many of the shoulder and arm movements that I saw in the concert hall performance. go to 6:30—7:00 to see flexible hand dance segment. Then 12:15 to end to hear four different kinds of world-famous Mongolian throat singing. 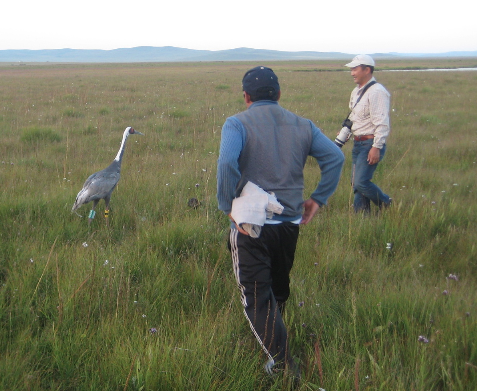 The most fun—and the most exercise—I had in Mongolia was running after crane chicks that couldn’t yet fly and that the scientists wanted to capture, weigh, measure and band with colored,identifying leg rings and in some cases radio transmitters. They did this for about 42 birds, most before my group arrived, and it was quite an experience. To understand the importance of this work, it may help to know how few cranes there are world wide for some of the species we saw. 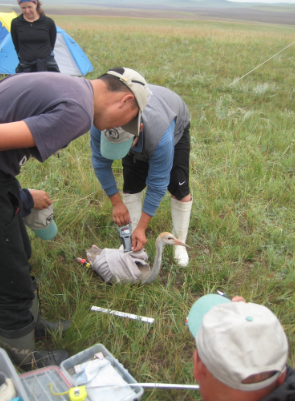 Although there are 500,000 Common cranes and 300,000 Demoiselle cranes, there are only 11,000 Hooded cranes, 3500 Siberian cranes, and 5000 of the White-naped cranes that we were banding. Seven of the remaining 10 species only number 8-30,000 each, another two thriving at 150,000 (Brolga) and 600,000 (Sandhill) each, and the Whooping up to 600. The last two are the only wild ones in America, and I have seen them both during their annual migration through Nebraska. All 15 are at George’s foundation HQ in Baraboo, Wisconsin. OK here is how you catch a crane. One scientist stood on the roof of the van with a 40-power telescope on a tripod to follow the birds—adults and chicks. 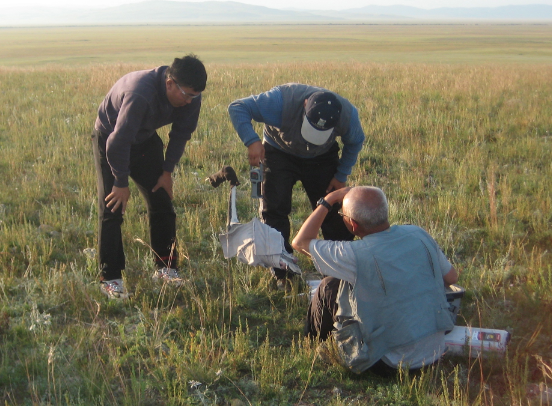 He had a walkie talkie that communicated with one of the Mongolian men—all three in their 20’s—who would do the chasing. The runners were either barefoot or wearing a rubber sock, like fly fishermen wear to give them traction and stability in the water. This is because the wetland, where the birds live and eat, is really a swamp of grass about 12 inches high in water 3-8 inches deep on top of soil that is all mud. Perfect crane habitat. Terrible for running: it’s soft, squooshy, and you sink in with every step. You also don’t know with each step how deeply you will sink, or how deep the water is…you can’t see it, and you are running as fast as you can. I know this, because I did it a couple of times. Very exciting. Of course I couldn’t run as fast at first as Itra, Batra and Chuka, especially in my tennis shoes (size 14) and wool socks, but I was able to keep up with them for much of the chase. The second time I took their advice and just ran in socks, and that was much easier. We ran about a mile non-stop as fast as possible. I caught up to the group in maybe 10 seconds. 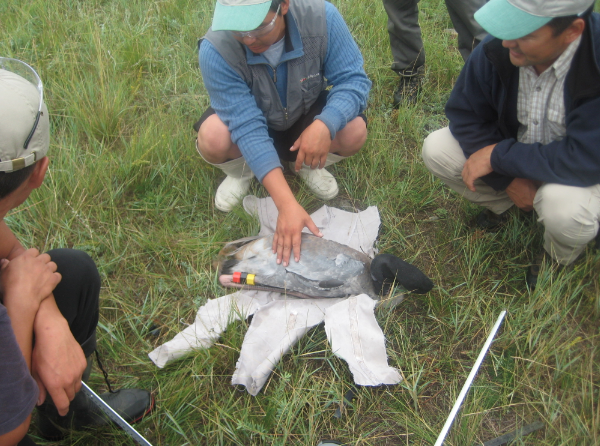 They had found and caught the chick and were swaddling it in a fitted diaper with velcro fasteners. A black sock on its head calms all the cranes for some reason. George and the three women in our group had walked into the swamp for a closer look when all the runners took off. Jennifer the scientist in her 30’s is training for 5k races, and she was with me for a few hundred yards and then stopped running. George was looking at wildflowers and plants with his binoculars and laughed a lot later about how he was watching me run at one point, “And then he totally disappeared!” This was because I suddenly stepped into some water that was really a stream, and I sank 3-4 feet deep, up past mid-thigh. That was a surprise. Fortunately I wasn’t hurt, but walking on the way back, I saw that there was no way to avoid the crossing hidden in the grass, and I stepped into the deep water again. I am very proud that Itra kept saying how fast I ran and that I kept up with the other runners. Hours on the tennis court seemed to pay off in the steppes. 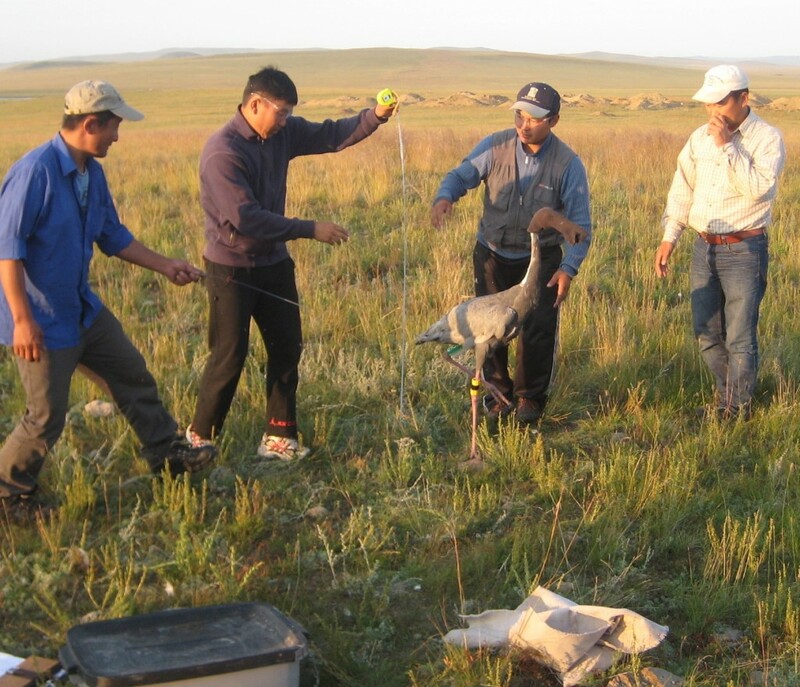 Back at the vehicles with the bird, a lot of measurements are taken after the bands are attached to the bird’s leg: height, weight, wing span, beak size, leg length, etc. Then the bird is released back to its anxious parents in the hopes that a colleague in some other country thousands of miles away will let them know that it has passed through or arrived. I remain amazed that two of the scientists have visited these countless wetlands spread over hundreds of miles so often that they not only know each one of them, not only know which of the hundreds of forks in the trail they need to take to get back to them, but also know how many pairs are at each wetland, which ones have chicks or not that year, how many chicks (one or two or none–they “failed”) and whether or not they have already banded that chick. I think it’s astonishing. The trails are not marked, and they all look almost the same to me. Also impressive was to learn that Nimba, the scientist who studied raptors in his early years(late ’90’s), was familiar with all the raptors in the valley we went to, knew where all the nests were, befriended the nomads whose gers we visited and ate in, and was instrumental in having the government designate that area as a preserve that cannot be developed and disturb the birds’ habitat. 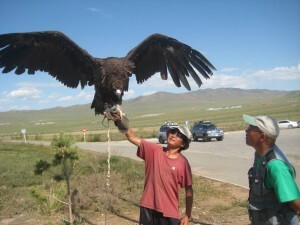 But it was mind-boggling to also discover that he climbed up or down mountains and cliffs to go to every nest, and that the Black vultures came to know him so comfortably that they would perch just a few yards away, while he went into their nests and measured and weighed their nestlings who couldn’t yet fly!!! 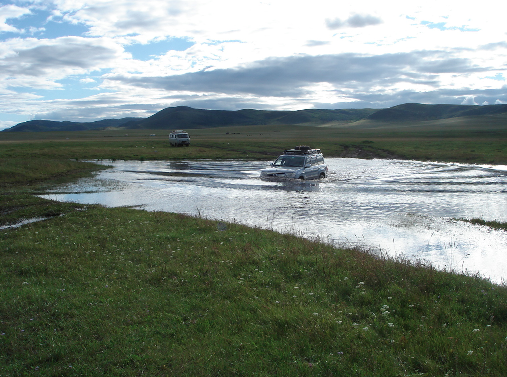 On the way to visit Chinggis Khan’s birthplace, the main trail/road was washed out, so our caravan had to cross a stream that was mostly mud. At the narrowest point, there was already a blue truck with two horses in the back that was buried deep in the mud. Nearby farmers were making money by charging vehicles for tows, but after many attempts, not even two tractors pulling simultaneously could move the truck six inches. 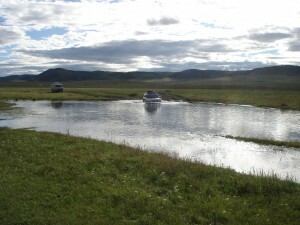 Our two SUV’s had made it across, and they gave it a try from either end. But broken cables and great frustration were the only result. For some reason I never understood, our cook van attempted to cross right next to the blue truck. But it failed to make it, and then the driver kept giving the van gas, so the wheels could spin and dig themselves deeper into the mud. DON’T SPIN YOUR WHEELS IN MUD, SNOW OR SAND IS ONE OF THE BASIC RULES OF DRIVING. Now both vehicles were stuck, and two tractors and two SUV’s couldn’t move our van either. a muddy ford is no problem for a horse! What to do, what to do. I eventually suggested that the horses should come out of the blue truck to lighten the load. That did the trick…although I can’t be sure that anyone really listened to my advice. 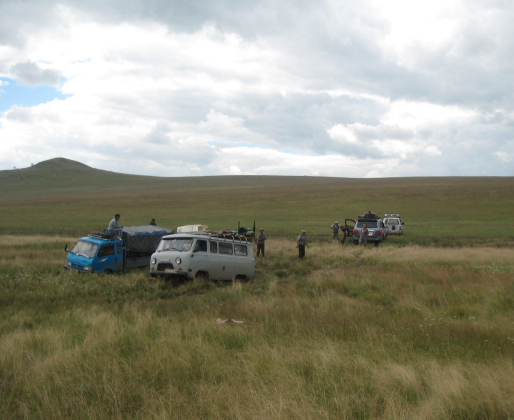 The cook van also had to be emptied of its load, so out came the tents, stove, chairs, food…almost everything…and we had a picnic lunch, while pure manpower with shovels first took away some of the dirt and grass. Cleverly, there was a rubber, inflatable “jack” that was used to then help raise the van about a foot higher. And it used exhaust fumes from an SUV to fill up this red balloon. After 2 1/2 hours, the lighter van was also liberated by two SUV’s doing the towing. Once all the supplies were repacked, we were finally on our way. 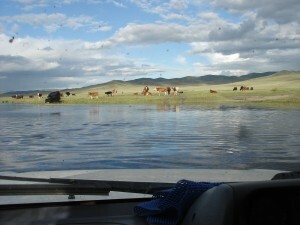 But this was just another example of life on the steppes, when there are no tow trucks you can call with your AAA card. And for some reason, I was pretty calm, enjoying the view, the food and the experience. George’s perfect attitude was having its effect. 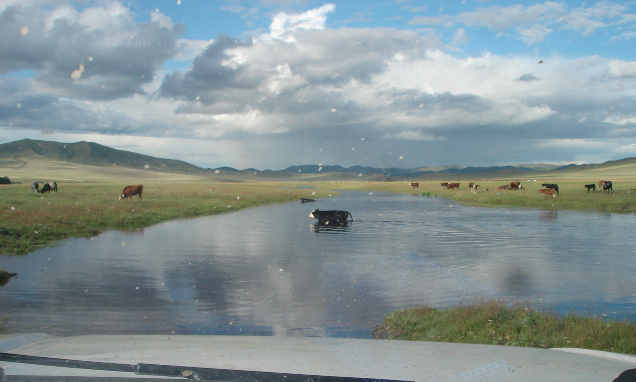 Our first river crossing in Mongolia was pretty tense…I couldn’t believe we were going to attempt it—the water looked pretty high to me. But the lead car made it first, followed by the second one. Finally it was the van’s turn, and it almost made it…until the engine died. Was it flooded with water? How were we going to move it to shore? No one else was around. No trucks or tractors to help us pull it. At that moment, when I was concerned and puzzled, our fearless tour leader, George Archibald, yelled out, “Whiskered Tern, whiskered tern.” He had sighted a bird and wanted us all to grab our binoculars and relish its beauty. He was totally into the bird. 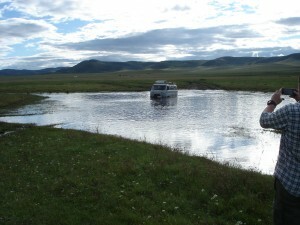 He did not give the van and its passengers in the water a drop of attention. Now that is what I call being smart. Not becoming anxious or ruffled by situations that are out of your control. George is a very rare bird himself! 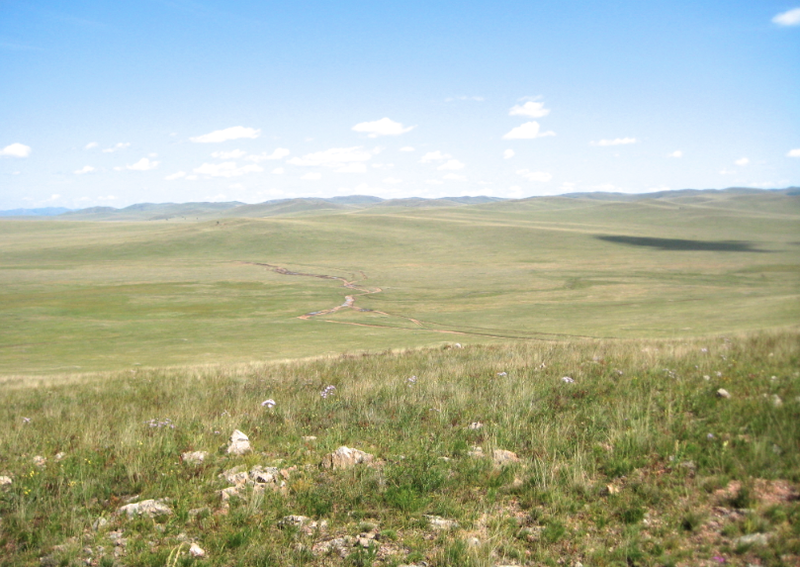 I just spent nine days camping in Mongolia plus two travel days via South Korea. 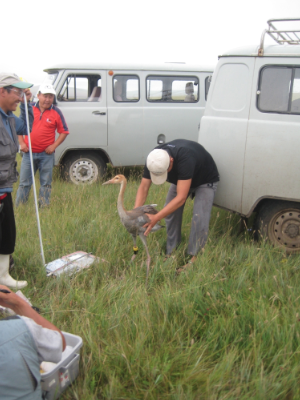 I joined five scientists studying cranes and their habitat, which is wetlands on the steppes. The five species of cranes we saw are 4-4 1/2 feet tall, and one of the major objectives was banding 40 of them with colored leg bracelets (including six with satellite transmitters) to track their migration routes, which may end in India. 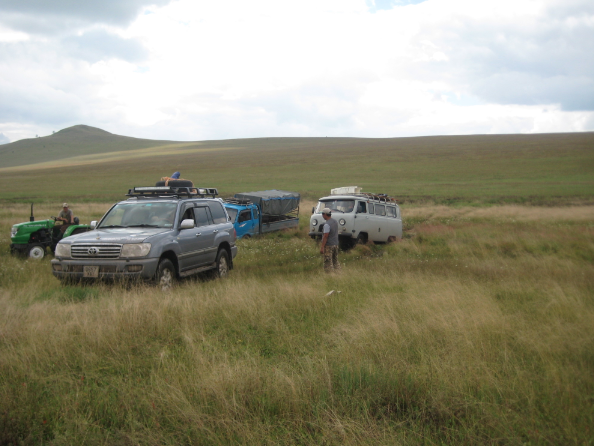 This was a very rough, tough, demanding trip that I wouldn’t recommend for anyone. 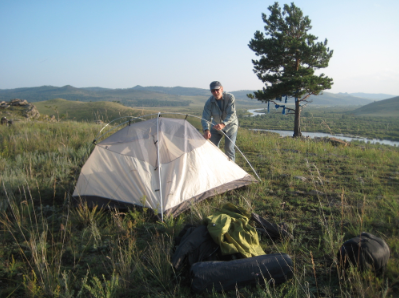 Zillions of mosquitos, setting up/tearing down my one-man tent every night, 5-10 hours of daily driving on washed out, rutted dirt trails called roads that are flooded, washboarded and at 30 degree angles. 40 mph felt like a car chase in a cop movie. Strapped in and holding on. 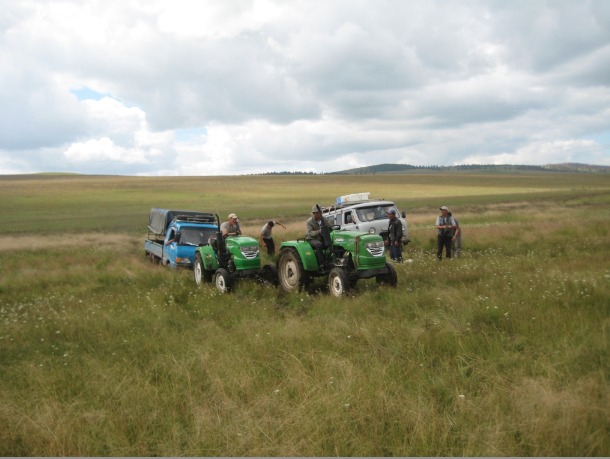 Sometimes we were completely off road climbing hills like you see in macho truck commercials that have small print warning you to not duplicate these rides by professional drivers. And the cook van was stuck in a river we crossed for 2 1/2 hours as we dug out the mud and grass underneath after our SUV’s and borrowed farm tractors failed to pull it out. I am proud that I survived this adventure. I am proud that I did daily push ups or crunches on my air mattress. I am sure my quads strengthened with all the bending in-out of my small tent. I am thrilled that I didn’t fall off a 400-foot cliff, when I was urged to lean over the edge, while standing up, to see a black vulture chick in its nest that was still too young to fly. But I was scared out of my mind when a 65-year-old woman who had also tagged along crawled to the edge of that cliff in her sun dress and sandals and stood up to take a look herself. She may have been calm, but I was terrified SHE might fall off!!! What motivated me to go at all was George Archibald, the passionate and upbeat 67-year-old founder in 1973 of the International Crane Foundation (ICF). 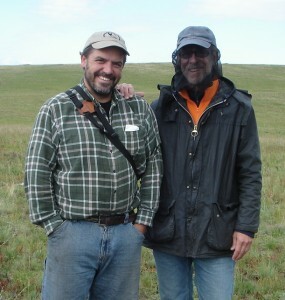 I joined George on a wildlife-viewing, non-camping trip in 2006 to Bhutan, where only 17,000 foreigners visited that year. 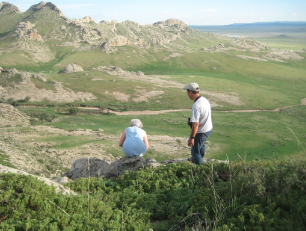 George has devoted 40 years to saving cranes and their habitat, which is always under attack by mining companies, developers and agribusinesses. He saved the Whopping Crane in America from extinction, so that instead of the 15 left in 1973, there are now 600. 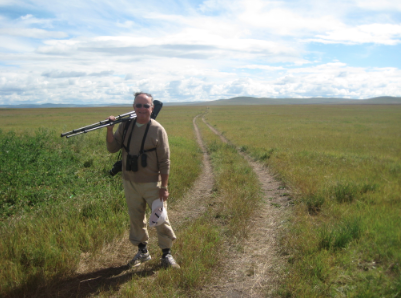 He has set up and supported through his ICF fundraising a network of like-minded ornithologists in remote areas all over the world, including Africa, North Korea, Middle East, India, Mongolia, Siberia, etc etc. 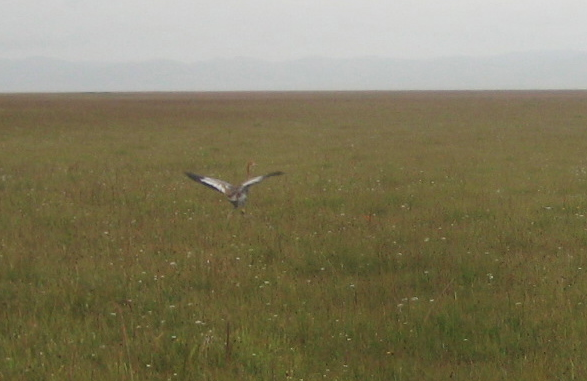 Crane migrations can sometimes traverse 11 countries, and if one of them is Iran or Afghanistan, the cranes are indifferent to political hostilities. This trip may not be an athletic achievement, but it was certainly a physical one…and the demands of the trip were much harder than I am used to. It was surely my last-ever camping experience, although I did eventually take in stride not bathing for eight days, not changing clothes, not washing even my hands with soap, and having just four small sardines on a slice of bread for dinner–the easy way to lose five pounds in a week. I was definitely the wuss of the group: the only one to bring a bug net for my face and head, and the only one to bring insect repellent on the 6 am bird walks before breakfast. 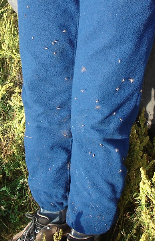 Two of the scientists had gone three weeks without washing. It’s a world that is very foreign to me. God bless them, every one. One of the major benefits of the trip was learning about Chinggis (spelled Genghis by Persians) Khan and his grandson, Kublai Khan. I will talk later about their astonishing achievements. 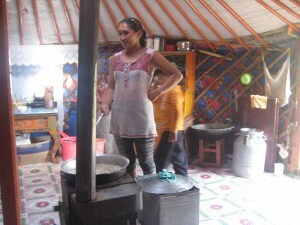 I also ate some local foods prepared without normal Western cleanliness and drank alcoholic fermented mare’s milk out of unwashed community bowls. So far not sick, but quite a change from everyday life in Connecticut!